The award denotes the preeminent position of Caye International Bank in the global financial marketplace and its unequaled commitment to customer service. As Senior Vice President of Caye International Bank, Luigi Wewege received the award on behalf of the bank. 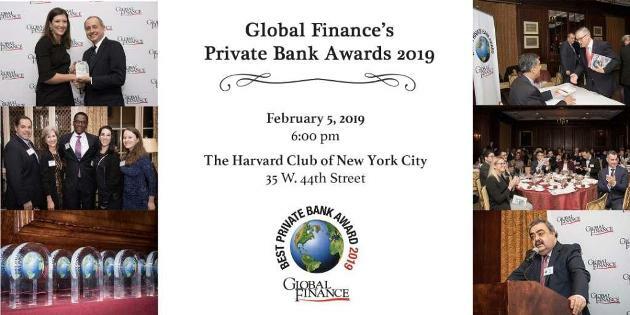 Global Finance’s 2019 Private Bank Awards gala dinner was held on Tuesday, February 5th, 2019, at the Harvard Club of New York City. The event began at 6:00 p.m. and included a reception, a formal dinner, and a keynote address by the author of Mortal Republic, Edward J. Watts. Awards were then announced, and the evening concluded with drinks and networking at this exclusive venue. 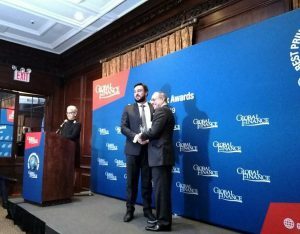 Global Finance Magazine drew on a number of resources when choosing the winners of its 2019 awards. Public filings, company reports and statements, recommendations from financial industry leaders, and the guidance of analysts and experts in the financial industry were all part of the decision-making process when determining the winners of these prestigious awards. Caye International Bank’s reputation for outstanding customer service was a key factor in its selection for the award. Wewege went on to commend the leadership of the bank’s Board of Directors and to express thanks to the clients and shareholders that make the success of Caye International Bank possible. Belize offers outstanding security and safety for client deposits, making it an excellent choice for investors from the U.S. and other parts of the world. The stable economic conditions in Belize and the fact that its currency is pegged to the U.S. dollar provides greater comfort and confidence for bank customers. People can also feel safe when depositing their money in Belize because the Central Bank reserve requirements in Belize are at least four times the reserve requirements of those in the United States for their local banks. An example of this is Caye International Bank which has one of the highest liquidity ratios of any global bank and this is currently set at 24 percent. This entry was posted on Wednesday, February 20th, 2019 at 10:58 am	and is filed under Company News. You can follow any responses to this entry through the RSS 2.0 feed. You can leave a response, or trackback from your own site.